Ford has sold four million Ford Fiestas in the UK since sales started in 1976. The Fiesta has topped UK small car sales charts for 27 of the 37 years it has been on sale, and has been the overall bestselling car in the UK since 2009. The four millionth car – a candy blue Zetec – has been handed over to its owner in the North East of England. The Fiesta is no longer produced in Britain but it was made in Dagenham from 1976 to 2002. The UK is still an important place for Fiesta production, though – the Dunton Technical Centre is home to the 1.0-litre EcoBoost engine while the Dagenham Diesel Centre develops diesel powertrains for fitment to the Fiesta. Things have moved on since 1976 – it’d take 80 modern Ford Fiestas to produce the same level of NOX emissions as the just one original 1976 car. 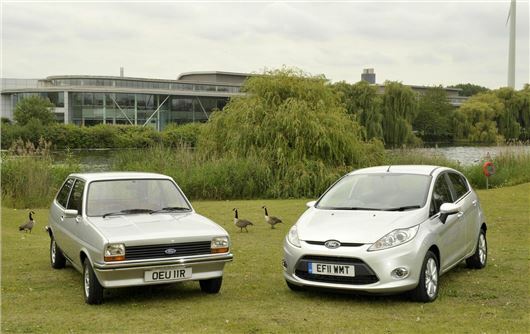 The old Fiesta had a 950cc engine capable of 37.7mpg while the modern Fiesta 1.0 EcoBoost manages 65.7mpg on the combined cycle. There might have been four million sold since 1976, but according to our How Many Exist section they haven’t all survived. In September 2012 there was a total of 1,374,140 registered the vast majority of which were originally sold in the 2000s and 1990s. Only a few hundred from the ‘70s are left, while just over 8000 ‘80s Fiestas survive. So while sales keep booming for the small Ford it seems the older examples aren’t necessarily being preserved – but then who would attach historic value to something so apparently abundant? It’s a story we saw with our most endangered list, more about which you can read by clicking here.